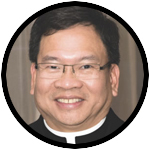 Father Michael Nguyen, a Vincentian priest of the Eastern Province of the Congregation of the Mission, knows what it is like to leave one’s country for a better life, as a 13-year-old with the boat people fleeing Vietnam. The following is adapted from a novena he preached Oct. 7, feast of Our Lady of the Rosary, at the Shrine of Our Lady of the Miraculous Medal in Philadelphia’s Germantown section. I was born and grew up in Vietnam. I remember each night my family gathered and recited the rosary together. By the time I was 7 or 8 years old, I knew how to pray the rosary. I memorized the joyful, sorrowful, and glorious mysteries. I could recite the rosary by heart. Many of you here probably remember the Vietnam War. I grew up in the middle of that war. In 1954, Vietnam was divided into North and South. The North was supported by the communist Soviet Union and the South was supported by America. My family lived in the South. I remember seeing the American soldiers. They were very kind and nice to everyone, especially the children. The best thing about the American soldiers was when they saw the children, they gave out candies and gum. I remembered how good the candies and the gum tasted. Unfortunately, the war was tragic and costly. Many lives were lost. The impact of that war is felt even to this day. In the end, the Americans withdrew and the South felt to the North in 1975. The communists took control of the whole country. I was 8 years old at the time. When the communists took over, people lost their freedom. For all of us as Catholics, we also lost religious freedom. Many Catholics suffered from persecution, especially the bishops and priests. Lives were difficult for everyone. There was not much of a future for the people. As a result, many people tried to escape the country. During the late 1970s and early 80s, a massive number of people of Vietnam escaped the country by boat. They were known as “boat people.” I was one of those people. It was very dangerous. People had to pay a great deal of money to get on a boat. Everything was in secret because if you were caught by the government, you would be put into prison. The boats that the people used for escaping were not very big. They were not really equipped for the sea, especially if there was a storm. As a result, many people died on the sea. When I was 13 years old, my parents paid the money for me to get on a boat. My parents knew that the trip would be dangerous, but they felt that for me to have a better future it was worth the risk. I still remember vividly the day that I left. My mom took me to the secret place where I stayed until they took me to the boat at night. I remembered saying goodbye to Mom. I was afraid. I thought that I would never see her again. My mom gave me a small bag. She opened the bag and showed me everything in it. There were a set of clothes, some food, and some medicine. She gave me detailed instruction on how and when to use them. She handed the bag to me to hold on to. Then, she asked me to give her my hands. I put my hands out. She put a rosary into my hands. She said that the rosary will be the most important thing for me. She said, “no matter what happens, don’t lose the rosary.” She told me that I should pray the rosary often. Especially, when I am afraid or in danger, I should remain calm and pray the rosary. My mom said that when I pray the rosary, the Blessed Mother will protect me and keep me safe. With that advice, my mom said goodbye and she left. I waited in that secret house until the night when they brought me to the boat. There were 53 other people in the boat. I did not know anyone in the boat. I was scared and afraid. I missed my family. But I remembered my mother’s advice to pray the rosary. So I prayed the rosary often! The food and water supply on the boat was limited. Each person on the boat was given a small amount of food and three cups of water each day. After four days, we were still in the middle of the sea. Land was nowhere near in sight. Our food and water supply were running low. I ate the little food that I brought with me. Then the worst happened. The engine of the boat broke. The boat was just floating. Everyone in the boat became frightened. The thought of dying entered my mind. But again I remember my mother’s advice. So I took the rosary out and prayed. The boat was floating for about half a day. Then, the miracle happened. A giant ship approached us. It was a German ship. They rescued us from the sea and brought us to the Philippines. I stayed in the refugee camp eight months. Then I was allowed to come to the U.S. When I left my family that day, I thought that I would never see them again. But thank God diplomatic relations between the U.S. and Vietnam resumed not too long after that. I have since gone back to visit Vietnam and my family a few times. My dad passed away. My mom and some of my siblings are living in America now. As I look back, I am convinced that my parents made the right decision to let me go that day. I feel very blessed and happy as a priest in the Vincentian community. I believed that God protected me in that trip through the praying of the rosary to the Blessed Mother. I also believe that was part of the plan that God has for me. And, praying the rosary helps me to continue to feel God’s protection and guidance, especially in the difficult moments of my life. Mary followed the plan of God faithfully. The plan God had for her was certainly filled with many hardships and suffering. But she never lost her trust and faith in God. Mary has given us a great example of how to follow the Will of God and of being a great disciple. Just as God had a plan for Mary, I believe that God also has a plan for each of us. Prayer is the way that we come to know the will of God. Praying also helps us to do and follow God’s will faithfully. The rosary has been and continues to be an important part of my prayer life. I continue to pray the rosary often. Praying the rosary helps me to know and to trust God. It helps me to experience that God is with me and protects me. I encourage you to pray the rosary to the Blessed Mother often. Mary will hear your prayer and intercede to God for you. Praying the rosary will help you to know that God is with you and protects you. Let us pray that through the intercession of Our Lady of the Rosary, may God bless us and keep us safe. Amen.